A great menu to suit all appetites & budgets. From a Casual menu with appies to Fine Dining. Super International wine list & daily drink specials. Located in the Okanagan Golf Clubhouse just 3 minutes walk from the Borgata Lodge. Stay at the lodge then enjoy a nice evening of dining & quality service at Sarazen’s Restaurant. Personalized friendly Service, bon appetite ! Breakfast served 30 min prior to 1st tee time. Offering nice views of Els Lake, & 18th hole of the famous Quail Golf Course. Sit outside, enjoy the fresh air, listen to the song birds. Voted Kelowna’s Best Pizza !! Meet Lilian the owner, she will cook you a fresh home made Pizza from scratch ! Call the front desk and ask for one of the Host Suites, they offer nice views of Els Lake. The deck is large enough for groups up to 20 to enjoy a BBQ or catered meal. We can even arrange a ” Kelowna Private Chef” for your special occasion. Enjoy a more casual atmosphere. Offering a wide selection of popular & casual dishes. A variety of seating options, from nice large lounge chairs to a large table for a group. Something for everyone. Enjoy your appetizer, meal & favourite beverage while taking in the latest sporting events on the large screens. Great location after your game to summarize over a cold beverage. Bring your friends and cheer on your fav team. From PGA Tour Golf, to Hockey, Soccer, Football, Tennis ,Baseball and tons more. Go Canada go ! Watch the golfers finish their game on picturesque famous Bear Golf Course 18th hole. 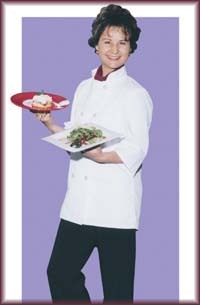 Delightful, bubbly & a very talented Chef that can come to your suite. She cooks multi course gourmet meals, cleans up & then leaves you to your privacy. Several options and culinary selections are available. Tara will work with you on the phone or meet with you upon arrival. Discuss your custom menu and any special dietary requirements.